Working with a stable line up since 2007's Sinister Minds, Germany's Jaded Heart returns with their ninth studio album Perfect Insanity. Jaded Heart knows a good thing once it's going so not much has changed musically in the last several years. 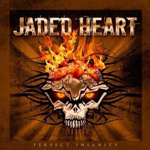 Perfect Insanity is straight up melodic heavy metal with a rushing of typical metal riffs, soaring guitar solos, and hook laden metal choruses. I could qualify this a little more and say that some songs, like Blood Stained Lies and possibly, Hell Just Arrived, find Jaded Heart sounding heavier. But I don't think you'd notice over previous releases. Vocalist Johan Fahlberg seems to have come into his own (and out of the shadow of Michael Bormann), but also seems to be bolstered by better vocal arrangements and support from the rest of the band. If the tried and true is your thing in melodic heavy metal or you're simply a Jaded Heart fan, you will not find better in their latest, Perfect Insanity. If the tried and true is your thing in melodic heavy metal or you're simply a Jaded Heart fan, you will not find better in their latest, Perfect Insanity.